I write about nature, food, the environment, home, family, community, and people. If I’m going to be honest, then I have to admit that turnips are not my favorite vegetable. Oh, I don’t hate them. If someone serves turnip to me, I can eat it and still maintain a pleasant expression. (But then, that is true with me for most food. I am not a picky eater. I am a good eater.) However, turnips certainly don’t make my taste buds soar the way sugar-snap peas, corn, and cucumbers do. What to do, then, with the turnips, so hard and white, tucked in the CSA box that Farmer Kev delivered a couple of weeks ago? I had put the turnips in a bowl with water and then had put the bowl in the refrigerator. I change the water every few days, and the turnips have remained plump and hard. But I knew the turnips couldn’t stay this way forever, and the time had come to eat them. Clif suggested, “Make them into patties.” Clif loves patties—almost any kind—the way some people love chocolate. “All right,” I said. I had done this last year, but I hadn’t kept the recipe, so I rooted on the Internet and found one at Simply Recipes. I used that recipe as a guideline, but I made enough changes so that I can safely call it my own. Because turnip and potatoes cook at different rates, I boiled them in separate pans—the potatoes took about fifteen minutes and the turnip was closer to twenty. When the vegetables were soft, I drained them, put them in a bowl, and mashed them with a fork. When the potatoes had cooled, I added 2 small cloves of chopped garlic, 1/2 cup of grated cheddar cheese, 1 beaten egg, 1/4 cup of flour, 1/2 teaspoon of salt, and several grinds of pepper. Clif, who loves frying patties as well as eating them, dropped them by large spoonfuls into hot oil in a cast-iron frying pan. 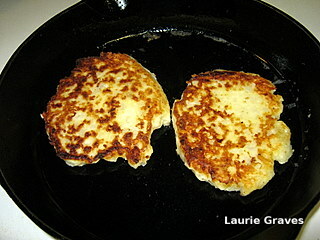 As the patties turned a lovely, golden brown pan, I had a good feeling about them. Surely something so visually appealing would taste good. And readers, they did. Clif pronounced the patties, “Pretty darned good,” which in Yankee parlance is the equivalent of delicious. We sprinkled salt on top of the cooked patties and spread a dollop of mayonnaise. As I ate my turnip patty, I not only had a pleasant expression on my face but also a smile. Clif was right. The turnip patties were tasty. If someone wanted to get fancy, then he or she could make some kind of aioli to go with the patties. But this was a Thursday night supper, and mayonnaise worked just fine. I made corn bread to go with the patties, and a beet green salad with shredded carrots, sunflower seeds, and feta. I have two more turnips in the bowl of water in the refrigerator, and I know what the turnips’ fate will be—more patties. This year, I’ll keep the recipe, with all its hand-written amendments, and file it in my veggie recipe folder. That way, next year, I’ll know just what to do with turnips. In separate saucepans, boil the turnip and the potatoes. The turnip will take about twenty minutes, and the potatoes will take about fifteen minutes. When the vegetables are very soft, drain them, combine them in a bowl, and mash them with a fork. When the mashed mixture has cooled, add the garlic, the egg, the flour, the cheese, the salt, and the pepper. In a heavy frying pan—seasoned cast iron works best—heat about 1/4 inch of oil until it starts to shimmer. Drop the mixture by large spoonfuls into the pan and press them thin, about 1/2 inch. (We used two cast iron frying pans so that we could cook the patties all at once.) Fry the patties until they are a lovely golden brown, about four minutes on each side. Serve with more salt and pepper. Add a dollop of mayonnaise and rejoice that humble turnip can taste so good. For the past three years, I have been working on the library expansion campaign whose goal is to build a much-needed addition for our cramped, little library. 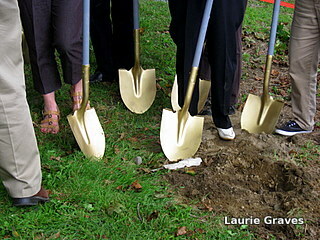 The ground breaking commenced a couple of weeks ago, and the project is expected to be done by April. Or so. 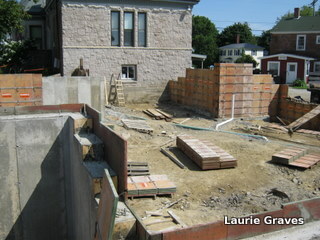 It is both wonderful and exciting to see this project become real, with dirt being dug and walls being built. For the next six months I’ll periodically be posting pictures of the progress. 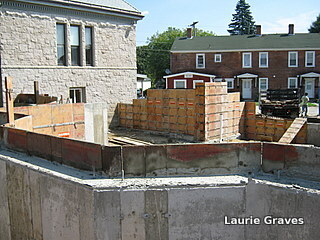 Yesterday, as I was taking pictures, I met Phil Locashio, the very talented architect who is overseeing the expansion. We spoke about how moving it is to be involved with a project that will benefit Winthrop residents long after we are gone. As a rule, only wealthy people are involved with such projects. Everyday people, not so much. Later, I biked to Joan Wing’s house, and I told her about our conversation. “It gives me goosebumps to think about it,” she said. 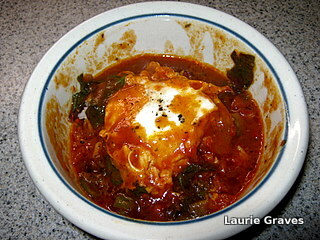 Last night I made shakshuka for supper. And what is shakshuka? 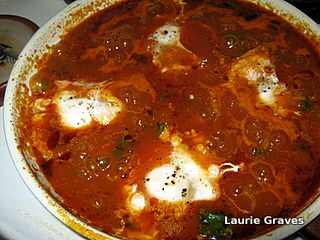 Basically, it’s a Middle Eastern dish that includes poached eggs in a tomato sauce. I love poached eggs. They are my go-to supper when I have meetings and come home late. I always have them with buttered toast, of course. But until yesterday, I had never even heard of shakshuka. I came across the dish on Food52, a terrific website that features tasty recipes that are relatively simple and inexpensive to make. I saw poached eggs, I saw tomato sauce, and I thought, “This is a meal I am going to like.” I had everything I needed for shakshuka, and I decided to make it last night for supper. I modified the recipe a bit. As onions bother my stomach unless they are simmered for a very long time—half a day or so—I decided to use green peppers and garlic instead. For those with a hardier stomach, onions would be great. 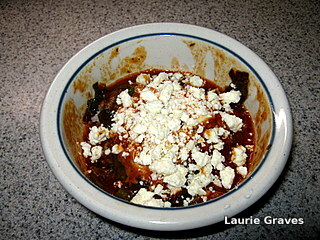 The title for Kendra’s recipe is Shakshuka with Grains and Feta. For the grains I cooked basmati, but quinoa or farro was also suggested. I think couscous would be good, too. 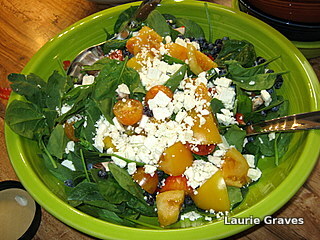 For greens, I used beet greens—Farmer Kev’s—but spinach or Swiss chard or any other green would work just fine. Now, I’ve waited until last to post the pictures because if I’m going to be honest, I would have to admit that this dish is not particularly photogenic. Kendra was right to call it a mess. But what a glorious mess! It came out exactly the way I hoped it would, with the eggs, the sauce, and the rice blending as a perfect trio. I used a sauce that had oregano, but if I hadn’t I probably would have added some just to give it a little zip. As I scooped up egg, sauce, and rice, I thought, “What could be finer on a warm summer’s eve than this hearty but economical and simple dish?” Nothing I could think of. 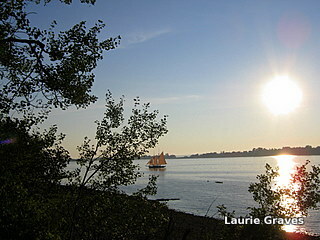 Yesterday, I went to Bailey Island, where my friend Sherry Hanson hosted a gathering of old friends. At one time, we all belonged to a group called Maine Media Women, and I’ve know many of the women for twenty years. 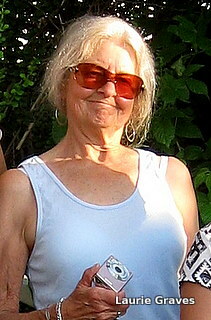 Sherry, who used to live in Maine, moved to the West Coast last year to be closer to her family. How we all miss her! Outside on the deck, we talked, ate lobster rolls—made just right with lots of claw and tail meat and with only a hint of mayonnaise—and admired the sparkling water. The weather couldn’t have been finer—warm with a deep blue sky. Sherry’s sister, Julia, joined us as did, Debbie, a friend from Sherry’s old neighborhood. Then there was Laney, Perian’s daughter. We’ve known Laney since birth, and we all feel like honorary aunties. Laney— lovely, slender, and on the edge of womanhood—is an island girl who keeps hens, sells eggs, and loves to ride horses. Plus, she was willing to run and up and down the long deck stairs to fetch things for her—ahem—mature aunties. A special, special girl. When the sun set, from all over the island conch shells were blown, horns were tooted, and fire works went off. Apparently this is a summer tradition. What a way to greet dusk and end the day. The gardens have reached that ragged, tattered phase, that end of August look. The snails have had their way with the iris leaves, which are now in shreds. No real harm has been done to the irises—I know this from past experience—but they look worn out, ready to be clipped back for fall. The daylilies—magnificent this year—are pretty much done blooming, and they are all stalks and yellow leaves. Even the bee balm, a glorious burst of red for well over a month, looks woebegone as petals fall and Japanese beetles feed on them. Still, there is that spicy bergamot smell coming from the bee balm, and true to its name, it attracts every manner of buzzing bee, from bumble bees to smaller bees whose names I don’t know. Yesterday, as I ate my lunch on the patio, I watched a hummingbird moth work the phlox. Tufted titmice, chickadees, and woodpeckers came to the feeders at the edge of the patio. A few days ago, I saw a black and white warbler, the first ever at the little house in the big woods. If I were the type of person who kept lists, that bird would have been added lickety-split. Hummingbirds come to their little red feeder, which I keep well stocked with sugar water. 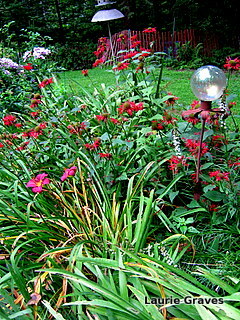 They also love the bee balm as well as the jewelweed, which grows at the edge of the lawn, just before the woods. 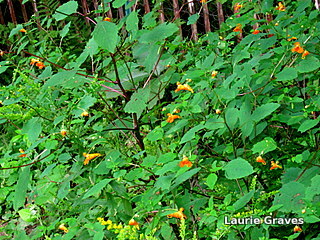 In early summer, I disliked the jewelweed’s leggy look and invasive ways. I didn’t recognize the plant for what it was, and I pulled much of it out, intending to take care of the rest by summer’s end. However, other tasks called, and the plants left behind lost their legginess and matured into a dark shapely green lit up with a myriad of tiny orange blossoms. Bees and hummingbirds love these flowers, and the plants bob beneath the buzzing, hovering activity. There is a lesson in all of this—be careful what you pull, be careful what you get rid of. What initially looks leggy and ungainly might very well mature into something bright and lovely and beloved. 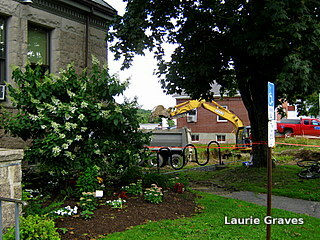 Yesterday was a banner day for the Charles M. Bailey Library. 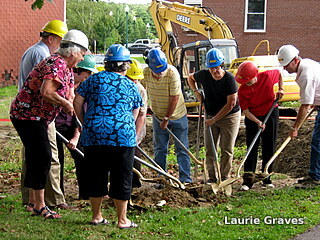 There was a ground breaking for the new addition, which if everything goes well, will be completed in April of 2015. It was a day of joy for all of us who have worked so hard on this project—six years for some and three years for me. As I’ve written previously, there have been low points as well as high points in this expansion campaign. In a town the size of Winthrop—6,200—it is not easy to raise a million dollars (or so!). But we are getting closer to our goal, and thanks to the town council, which approved a bond for us, we are able to get started now. We have wonderful support from the community, and we also have a terrific group of volunteers who will help us continue with the fundraising we need to do to complete the project. And, I expect new volunteers will join us as time goes by. So, allow me to blow the celebratory horn. Hooray for Winthrop, hooray for the library, and hooray for all who have helped make this project a reality! 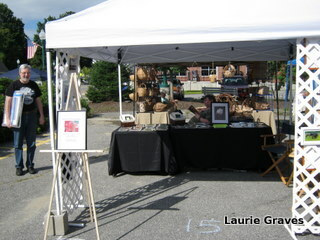 On Saturday, Clif and I were up bright and early—for us—to set up at the Winthrop Art Fair. The weather was good—sunny with clouds, not too windy, not too hot—and while there wasn’t exactly a crush of people, attendance was steady. Unfortunately, sales were disappointing. We sold enough cards to pay for the table fee plus a little extra, but not enough to warrant all the work we put into getting ready for this event as well as the two of us sitting at the fair from 10:00 a.m. until 4:00 p.m. Plenty of people came to look at the cards. They told us how pretty they were, but many of them left without buying anything. The cards—at $3 apiece—are a good price, so it wasn’t the cost. After the fair, Clif and I discussed the disappointing sales. While our cards are nice, perhaps flowers and scenery aren’t unique enough to grab people’s attention. With all the great, affordable, digital equipment that is available, taking good pictures has never been easier. Perhaps fairgoers felt they could take pictures and make their own cards. Or, perhaps people just don’t send cards the way they once did. Who knows? I realize that Winthrop is not exactly in the hub of things, and my card sales shouldn’t be judged by one fair. On the other hand, my expectations for this fair—the table fee plus $100 extra—weren’t unreasonable, and we fell far short of that. Alec Hartman, another photographer we know, was there, and his mother told me he did quite well. However, Alec takes unique and snappy pictures of animals, and he does a great job. Most people would not be able to get the shots he takes of bears, chipmunks, and various other animals. So, now I have to decide how much energy and money I want to put into this because by spending so much time on the cards, I neglected other things, including my writing. I have not made bread for two weeks, I have not kept track of sales in the various grocery stores, and I haven’t been as diligent at clipping coupons. Would my time be better spent doing those things rather than trying to sell cards? I honestly don’t know. Clif has suggested I try selling cards on Etsy, and I plan on following his advice. 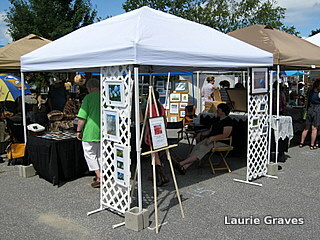 I might also do a couple of holiday fairs, where we would not only sell cards but calendars, too. To make up for the disappointing day on Saturday, we had a delightful day on Sunday at our friends’ home. 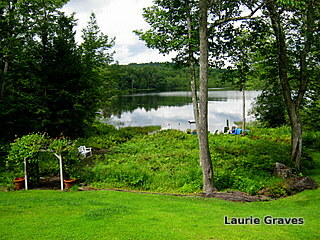 Jim and Dawna live by a lake, and this is the view from their deck. We had wine and appetizers on the deck, and the weather even let us eat our meal outside, too. We had grilled chicken, roasted potatoes, and a wonderful salad made with Farmer Kev’s heirloom tomatoes. 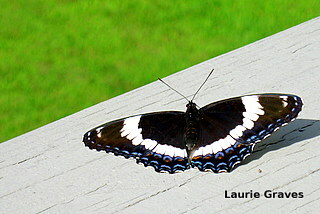 As a bonus, this butterfly—a black and white admiral, I think—landed on the deck and stayed there long enough for me to get this shot. I enjoy taking pictures, and I will continue to do so whether or not I sell cards. But this week I am going to take a break from cards. I will make bread, get the house in order, and maybe even do a little fiction writing. Then next week I will decide how much time I want to put into selling cards.